This variable assesses whether or not a state requires union membership for its employees. We have chosen to score states based on either a “yes” for the presence of a right-to-work law or a “no” for the lack thereof. This information comes from the National Right to Work Legal Defense and Education Foundation, Inc. Right-to-work status is as of January 1, 2019. Overview of states' Right-to-Work State? over time. Historical state ranks for Right-to-Work State? 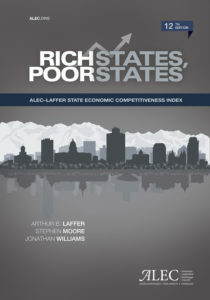 across editions of the Rich States, Poor States. Historical values for Right-to-Work State?. The years listed correspond to the actual data years, not necessarily the publication of Rich States, Poor States.